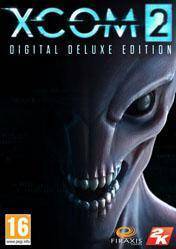 You can buy XCOM 2 Digital Deluxe Edition cd key for PC in digital download version at the best price from our selection of the best online gaming stores! This product is a CD key or digital serieal for XCOM 2 Digital Deluxe Edition wich you will must activated through the Steam games platform. After buying XCOM 2 Digital Deluxe Edition cd key, you will receive by email an activation code or serial, that you need to enter into your Steam account to proceed with the download of this game. The Deluxe Edition of Xcom 2 includes: The original game Xcom 2 and the season pass, which will give us access to a lot of extra content. XCOM 2 is the sequel of XCOM: Enemy Unknown, the award-winning strategy game of 2012. XCOM is the last line in defending the planet against the alien invasion. Now, in XCOM 2 invaders dominate the Earth, and our goal will be to lead a group of brave soldiers against this invasion and to uplift humanity from its ashes. The season pass will give access to 3 DLC, which will give us improved customization, new weapons for our troops and a new class available for our elite group. All stores listed in the following comparative price have been verified by our team and our users, so they are totally reliable. You can also read the comments in each "+ info" link that you will find in front of each store logos for more information on delivery times. Some of their prices my look good, but if you're tax rate is above on what they calculate them, they do not apply - register first and then check their prices! I, for this reason can't recommend this store for anyone except thos efrom the ~20% tax rate countries or for those outside the EU. For me this is only good for a 3/5, after applying my tax rate I can find heaps of cheaper stores!